Hello all my fellow writers and readers! Guess what? Tomorrow we will be half way through NaNoWriMo, which means that tonight, lots of people around the world will be fighting to get to 25,000 words before midnight. Including me. I need to write 2,500 words by tonight. Okay, well actually by tomorrow night, but I'd really LIKE to have it done by tonight. So yes, that means I'm at 22.5K right now! I cannot believe I've written this much in two weeks. It's all so much like a fantasy. High fantasy is more like your average fairy tale. Think Shrek. The first one. High fantasy has the elves and the magicians and the trolls and the princesses and the knights in shining armor. 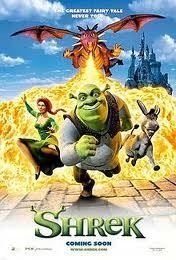 Some classic examples are Dealing with Dragons, The Hobbit, Ella Enchanted, and yeah, Shrek. Inkheart is another great one for this genre. This genre is not to be confused with Epic fantasy. Epic fantasy can have all of those things that are in high fantasy, but in Epic, the events have monumental importance. We're talking about huge rebellions and war on a massive scale. When I think of Epic Fantasy, I think more The Lion, the Witch, and the Wardrobe, the last Harry Potter book, Inheritance Cycle, Return of the King sort of thing. Battle cries and Kings and Queens. A lot of times, there is much less magic in these books, but not always. Some books can be both. Inkdeath is borderline Epic, I think. Tamora Pierce's books go either way, some closer to high, some on a more epic scale. The Harry Potters escalate from high to epic, with the first few books light hearted and the latter much more important to the fate of humanity. Does that make since? My favorite high fantasy is Artemis Fowl, with The Mortal Instruments as my current favorite Epic. What are yours?